Somebody’s ears must be burning because it’s time for another exciting episode of The Best Cuts of Music! Hosts Robe Flax and Sam Houser have embarked on a hell of an adventure! Why are they talking to demons? What lengths will they go to for a record contract? Why was Robert Johnson not mentioned?! Who is the president of hell and how does he get elected? 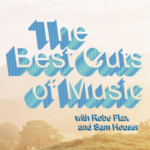 Find out some of these things and more on this exciting edition of The Best Cuts of Music!